Prior to joining Zoned, Lesley was at home with 2 energetic boys and was squeezed in workouts at a local gym when time permitted. Dan was busy as a Sales Executive in NYC and would run 15-20 miles per week, but that was about it. Prior to enrolling at Zoned Fitness we worked out regularly at local gym, mainly focusing on aerobic fitness but were inconsistent and our workouts lacked structure. We were definitely in a fitness funk. 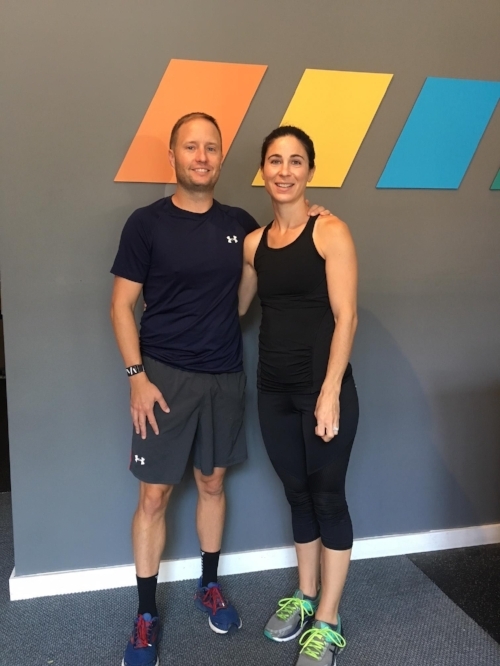 Our neighbor Flavia Powers highly recommended Keith and his training methods, which coincided with our desire to incorporate more strength and high-intensity workouts into our fitness regime. We both wanted to have more purpose to what we were doing in our workouts and Dan wanted to add a significant strength component. We have enjoyed Keith’s customized workout plans that challenge us, take into account our minor aches/injuries, focus on our training goals and leverages technology to provide constant feedback during and after each session. Zoned fitness has motivated both of us to be more consistent with our training, carving out time each week to get our workouts in has now become a priority. It’s been great working out together with Keith in our 1 on 2 sessions (when Dan’s schedule permits). The shared time and endorphin rush is something we both look forward to. We are now both making fitness a priority in our lives. Dan and Lesley, thank you for being amazing and dedicated members of the ZONED family! Keep up the great work!